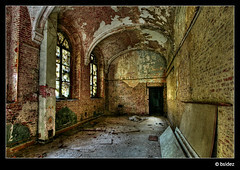 A shot from another convent in Mechelen, Belgium, wich seems to be full of such abandoned places. I like the decay in this picture very much, after years of just being empty. First i was not sure about this picture, but i kept me looking at it everytime i browsed through that set. So i decided to put it on flickr just to see your reactions.3xp.